Power Your iPhone from Fruit: Fact or Fiction? Main Site → Blog → Apple iPhone → Power Your iPhone from Fruit: Fact or Fiction? 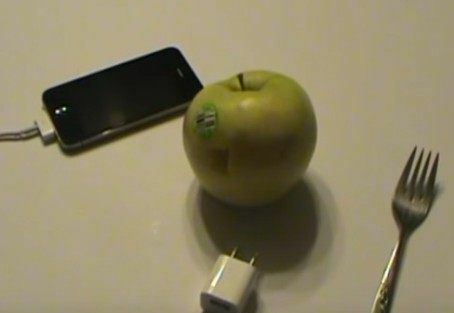 In this video the author (7 Trumpets Prepper) does some science experiments to see if the videos showing someone charging an iPhone with fruit are fact or fiction, or some cheap magic trick. Watch and see the results for yourself. (The Scripture condemns the following magic, wizardry, fortune tellers, witchcraft, soothsayers, etc. With that said as a person who is very skilled in technology I personally believe charging the iPhone with fruit is a cheap magic trick. This is my effort to dispel this myth and show the YouTube community the truth of the matter. I will in a future video show how to build a real Baghdad battery that is not a myth, but truly does work. Sincerely 7TP). The battery life of smartphones could be better. Here come some strange and impractical ways to charge your gadgets when a socket can’t be found. Urine-powered cell phone charger: Researchers from England’s University of Bristol and Bristol Robotics Laboratory propose a way to convert your pee into an electrical charge. They found a way to use bacteria grown on carbon fiber anodes by placing them inside ceramic cylinders. Right now the cell is the size of a car battery (a car battery full of urine!). The hope is that the urine battery will one day be portable. Although it may not be the most hygienic way to charge your phone. Give it some Coke: Chinese designer Daizi Zheng came up with a way to use soda or Coke to power a cell phone, provided the device was modified to include a chemical board capable of converting carbohydrates and sugar into energy. This is an interesting concept. Yo-yo charger: A Swedish designer, Peter Thuvander, came up with a way to give the yo-yo some real purpose in life. The idea is simple: playing with the yo-yo charges a small battery inside. Afterward, just plug in the phone via USB. Lingerie charger: Triumph International Japan Ltd presents lingerie with wires, connectors, and solar panels. The charger needs to be exposed to sunlight to work. Pan Charger: This charger converts heat – whether it’s from your stove top or the blaze of a campfire – into an electrical charge that will power gadgets via a USB plug. Wind charger: Wind farms generate lots of energy, so a similar idea can be applied to power our phones. A Netherlands designer Tjeerd Veenhoven designed the iFan, an iPhone case that converts wind into phone-charging energy. This charging case takes six hours to fully charge a phone, and that’s if the wind is continually blowing. However you could just drive along a highway with your iPhone hanging out the window, for example. Human Voice: Researchers at South Korea’s Sungkyunkwan University found a way to convert a person’s voice into energy. The average charger sends about four volts into a battery, so the noise would have to continue for several hours.